Of the many wild animals which live in the forest around PineSong, we have managed to photograph only a very few. Our list includes whitetailed deer, black bears, field mice, shrews, a pine marten, otters, beavers, muskrats, minks, gray fox, snowshoe hares, raccoons, a weasel, chipmunks, red squirrels and gray squirrels. In the winter, we feed the whitetailed deer. Since our neighbors also feed them, the deer herd survived the severe winter of 1996-97 quite well. So far, the winters of 1997-98 through 2000-01 have been very kind to the deer population. In fact, Wisconsin now has too many deer, and the Department of Natural Resources has instituted special hunting bag limits in hopes of reducing the size of the herd. 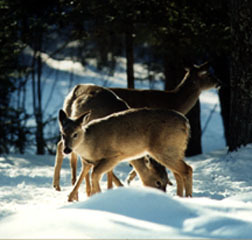 Too many deer can lead to habitat destruction and massive deer kills during severe winters. In 2002 the Wisconsin DNR issued a rule making it illegal to feed deer, so this winter activity will be curtailed for the moment. While we see their tracks occasionally, this is the only weasel I have seen at PineSong. It was hunting a mouse near the woodshed and appeared to be quite unperturbed by my splitting firewood, so I fetched the digital camera and waited for an opportunity. A weasel in its white winter coat is often called an ermine. 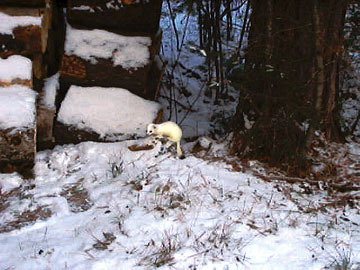 During deer hunting season in 2002, all four of us who were hunting at the cabin saw weasels in their white winter coats. The one I saw was watching me from a dead tree about 10 feet away, and I wished I had had my camera along. I spotted this young porcupine crossing a forest road a few miles from PineSong. With his rear quills erect, he was ready to defend himself. 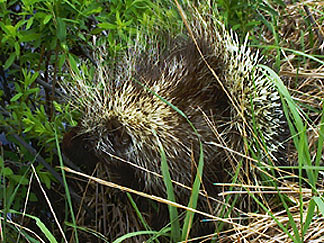 Many people have trouble getting along with porcupines, since they gnaw on any wood with salt in it...like axe handles, porch steps, outhouses and even cabin logs or wood siding. Dog owners, and presumably their canine companions, also object to the porcupine's method of defending himself. 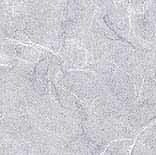 Thus, you encounter them mostly in wild areas where their only serious natural enemy is said to be the fisher. It was a bright day, and the grass and young willow leaves really did look this green. 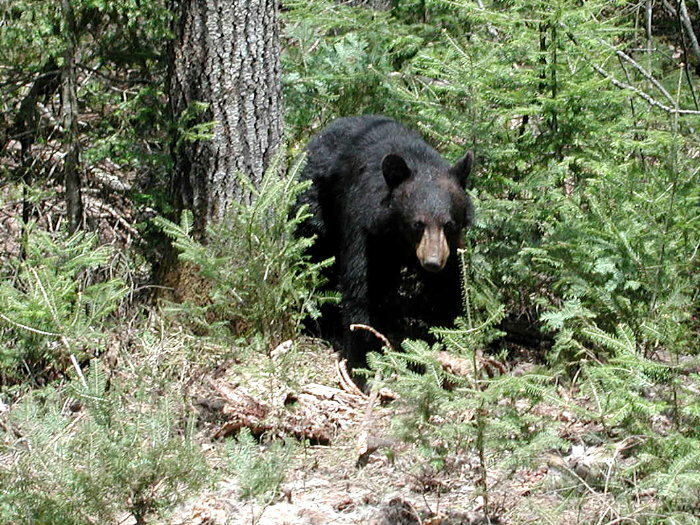 Here is another youngster I encountered this summer near another trout stream a few miles from PineSong. 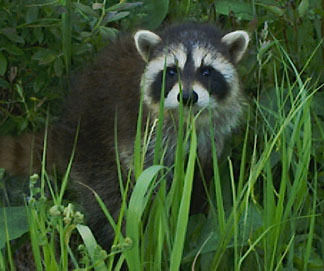 Apparently this little raccoon had become separated from its mother. Instead of running away, it tried to hide in the weeds, but when I pursed my lips and squeaked at it, it grunted like a piglet and came up to me to pose for a photo. 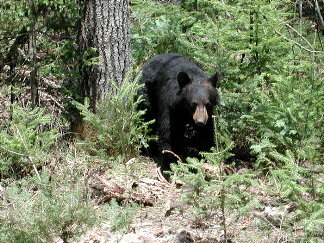 We have seen many different black bears at PineSong. One summer a small 120 pound bear actually came up to the patio doors and looked in at us. 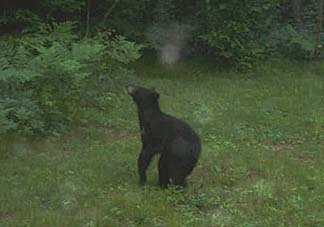 We have a photo of him in the yard here.That same summer, Jerri saw a large male which was estimated by our neighbors to weigh 350 to 400 pounds. The photo at the left shows a 300 pounder that Earl and I encountered along a town road west of Mason, Wisconsin after a fishing trip to the White River. He was very intent on eating ants or grubs from some old tree trunks exposed by a road crew. He would watch us from time to time, but we were the first to leave. click the photo to open a larger image in a new window. Many birds also live or visit the area as well. The most common year round species are chickadees, white and rose-breasted nuthatches, ruffed grouse, sparrows, hairy woodpeckers and the smaller downy woodpeckers, crows, bluejays, rose-breasted grosbeaks, pine grosbeaks and evening grosbeaks. Other year round residents more rarely seen are the large pileated woodpecker and the smallest north American owl, the saw-whet owl. Summer visitors include goldfinches, Baltimore orioles, ruby throated hummingbirds, indigo buntings, red wing blackbirds, great blue herons, mallard ducks, wood ducks, American eagles, and red tailed hawks. Winter visitors we see include juncos, pine siskins and the northern shrike.